What is ardamis.com built with? Techcrunch just posted a story about BuiltWith – a startup that reports on the technology behind the web site. I’ve written before about ways to ID the server, the scripting language, and the CMS technology behind a site, but BuiltWith goes further and provides analysis of that data. The BuiltWith report for ardamis.com knows that the site is running WordPress (no surprise there) on an Apache server, with the WP Super Cache plugin and Google Analytics and Google Plus One. For each item it recognizes that a site is using, WordPress as the CMS, for example, it provides statistical data on the number of sites on the web also using that technology, along with trend information showing whether its use is increasing or decreasing. It’s really pretty sad to see that Apache use continues to steadily trend down, even while it continues to account for the majority of web servers. HTML5 as a Doctype is on the rise, though, along with the use of microdata. BuiltWith can also tell what other sites are using that technology, but this information is a paid service, and an expensive one, too. This entry was posted in Web Site Dev, WordPress and tagged Apache, web app, WordPress on 16 February 2012 by Oliver Baty. I just picked up an old Dell Precision 690 workstation, which I intend to develop into a file server, a Windows IIS server, and an Ubuntu LAMP server. 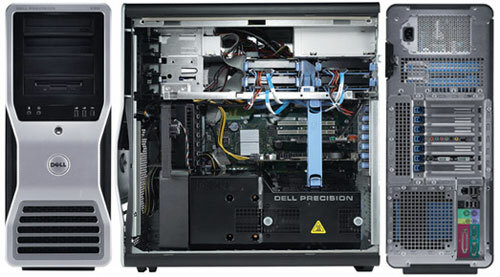 This monster was built in 2006, but it still has some neat specs and tons of capacity (7 PCI slots, 4 hard drive bays, etc…), should I want to expand further. Right away, the size of this thing suggests it isn’t a normal tower. It’s about up to my knee and weights 70 lbs. It feels like it’s made with heavier gauge steel than the typical chassis, but that may be me projecting. I immediately shopped around for more RAM, obviously. 2GB seems a little thin, even by 2006 standards, when considering the way everything else is high-end. The mainboard has 8 slots and supports up to 32GB, but I figure 6GB is a safe place to start. The workstation has three enormous fans, like, big-as-your-hand big. Running it with the chassis open causes some sort of thermal protection system to kick in and it spins the fans up to the point that they were blowing stuff on the floor half-way across the room. The CPU has a big, passive heat sink with six copper pipes and sits between two of those fans. I’m tempted to buy a second CPU, but I’ll hold off. I’m still on the fence about the SCSI drive. It should be super fast, but I’m a little spoiled by the SSD in my machine at work, so it’s hard to get excited about a mechanical drive, even one running at 15k RPM. The Nvidia Quadro card is also fanless, and has a bizarre DMS-59 connector. An adapter converts the DMS-59 connector into two DVI outputs. This entry was posted in Hardware, Linux-Ubuntu, Materialism, Microsoft, Projects, Web Site Dev and tagged Apache, Hardware, IIS, linux, Microsoft, mysql, network, php, XAMPP on 20 October 2011 by Oliver Baty. Just a few notes to myself about monitoring web sites for infections/malware and potential vulnerabilities. Your first stop should be here, as I’ve personally witnessed alerts show up in Webmaster Tools, even when all the following tools gave the site a passing grade. 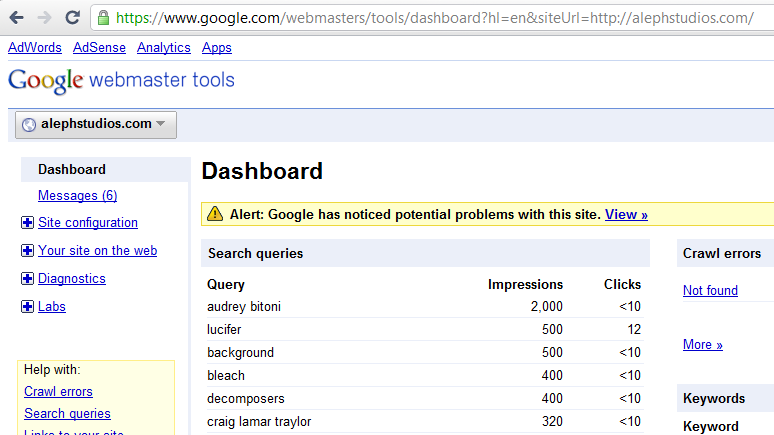 If your site is registered here, and Google finds weird pages on your site, an alert will appear. You can also have the messages forwarded to your email account on file, by choosing the Forward option under the All Messages area of the Home page. The Sucuri report for ardamis.com: http://sitecheck.sucuri.net/scanner/?scan=www.ardamis.com. This entry was posted in Nonsense, Tutorials, Web Site Dev, WordPress and tagged Apache, blogging, coding, htaccess, php, programming, security, WordPress on 7 May 2011 by Oliver Baty. Attempting to run the W3C Link Checker against //ardamis.com/ returns an error message. In other words, the W3C Link Checker requests the web page, and tells the web server that, by the way, it can only accept a responses in a certain format. The web server then regrets to inform the requestor that it cannot fulfill this request, because it cannot return a response that would be acceptable to the requestor. It does this in the form of a 406 Not Acceptable HTTP header. The W3C Link Checker then outputs this error. Ardamis runs on WordPress, with a custom theme originally developed years ago from the Kubrick theme and a handful of plugins (as more completely described at the colophon page). I tinker with the site, from time to time, trying to speed it up or what-have-you. But no amount of tinkering seemed to resolve this problem. Over the course of a few months, I’d try various changes to the site to see if there was something I could do to fix this problem. I had pretty much convinced myself that it was going to be an issue for my web host when, miraculously, after making some changes to the .htaccess file, my theme and disabling one of the plugins (which I can’t see how would possibly affect the HTTP headers) the Link Checker began working. I’m not sure what I did to make this work, or even if it was something I did. But further troubleshooting would have involved disabling all plugins, trying a different theme, and then ruling out WordPress entirely. This entry was posted in Nonsense, Web Site Dev and tagged Apache, htaccess, linux, php, troubleshooting, WordPress, xhtml on 8 April 2011 by Oliver Baty. I’ve written a few posts on how to speed up web sites by sending the correct headers to leverage browser caching and compressing .php, .css and .js files without mod_gzip or mod_deflate. The intended audience for this post is developers who have already applied most or all of Google’s Web Performance Best Practices and Yahoo’s Best Practices for Speeding Up Your Web Site and are wondering how to speed up WordPress sites in particular. I assume you’re familiar with WordPress caching and are already using a caching plugin, such as WP Super Cache, W3 Total Cache or the like. Remove any plugins you’re not using. Deactivated plugins can be deleted from the Plugins page. jdMorgan from WebmasterWorld.com has written a replacement for the .htaccess rewrite rule used by WordPress. This will speed up the WordPress mod_rewrite code by a factor of more than two. This is a total replacement for the code supplied with WP as bounded by the “Begin WP” and “End WP” comments, and fixes several performance-affecting problems. Notably, the unnecessary and potentially-problematic container is completely removed, and code is added and re-structured to both prevent completely-unnecessary file- and directory- exists checks and to reduce the number of necessary -exists checks to one-half the original count (due to the way mod_rewrite behaves recursively in .htaccess context). In the default WordPress template, the comment-reply.js script is included on all single post pages, regardless of whether nested/threaded comments is enabled. A simple tweak changes the theme to only include comment-reply.js on single post pages only when it makes sense to do so: if threaded comments are enabled, commenting on that post is allowed, and a comment already exists. Add the following lines to your theme’s functions.php. WordPress saves settings specific to your blog in the database. These settings include what language your blog is written in, whether text is read left-to-right or vice versa, the path to the template directory, etc. The default WordPress theme contains a number of database queries in order to figure out these things and build the correct page. The default theme needs this flexibility, but your theme does not. Joost de Valk recommends replacing these database queries with static text in your theme files in his post Speed up WordPress, and clean it up too! An easy way to do this is to browse to your web site and then view the source code. Copy the content that won’t change from page to page and paste it into your theme, overwriting the PHP with the generated HTML. On my blog, this HTML output is never going to be anything different, so why make WordPress look these settings up in the database each time a page is loaded? This line is an excellent candidate for replacement. The footer.php file contains a handful more opportunities for replacement, but go through each of your theme’s files and look for references to the template directory and other data that won’t change as long as you’re using the theme. All told, I was able to replace 12 database queries with static HTML. Joost also recommends checking for unnecessary or slow database queries, and installing a helpful debugging plugin, in his post on Optimizing WordPress database performance. 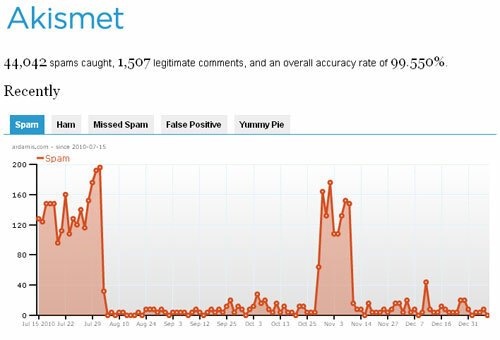 From the Dashboard, click Comments, then click on Empty Spam. This does not delete the latest draft of unpublished posts. It’s a good idea to optimize the table after deleting the revisions. Optimizing your MyISAM tables is comparable to defragmenting your hard drive. It’s probably been a while since you’ve done that, too. If you’re using phpMyAdmin, browse to your WordPress database. Under the Structure tab, at the bottom of the list of tables, click on the link “Check all”. In the “With selected” menu, choose “Optimize table”. (I would have recommended just optimizing tables that have overhead, but the wp_posts table can be optimized even when it doesn’t show any overhead. If the table has deleted or split rows, repair the table. If the index pages are not sorted, sort them. If the table’s statistics are not up to date (and the repair could not be accomplished by sorting the index), update them. When users request a page, it can take anywhere from 200 to 500ms for the backend server to stitch together the HTML page. During this time, the browser is idle as it waits for the data to arrive. In PHP you have the function flush(). It allows you to send your partially ready HTML response to the browser so that the browser can start fetching components while your backend is busy with the rest of the HTML page. The benefit is mainly seen on busy backends or light frontends. OK, so this isn’t technically a WordPress-specific tweak, but it’s a good idea. As a follow-up to my post on compressing .php, .css and .js files without mod_gzip or mod_deflate, I’m documenting the changes I made to the .htaccess file on ardamis.com in order to speed up page load times for returning visitors and satisfy the Leverage browser caching recommendation of Google’s Page Speed Firefox/Firebug Add-on. A great explanation of why browser caching helps the web deliver a better user experience is at betterexplained.com. Two authoritative articles on the subject are Google’s Performance Best Practices | Optimize caching and Yahoo’s Best Practices for Speeding Up Your Web Site | Add an Expires or a Cache-Control Header. It is important to specify one of Expires or Cache-Control max-age, and one of Last-Modified or ETag, for all cacheable resources. It is redundant to specify both Expires and Cache-Control: max-age, or to specify both Last-Modified and ETag. I’m not sure that this recommendation is entirely correct, as the W3C states that Expires and Cache-Control max-age are used in different situations, with Cache-Control max-age overriding Expires in the event of conflicts. If a response includes both an Expires header and a max-age directive, the max-age directive overrides the Expires header, even if the Expires header is more restrictive. This rule allows an origin server to provide, for a given response, a longer expiration time to an HTTP/1.1 (or later) cache than to an HTTP/1.0 cache. It would seem that Cache-Control is the preferred method of controlling browser caching going forward. HTTP 1.1 clients will honour “Cache-Control” (which is easier to use and much more flexible). HTTP 1.0 clients will ignore “Cache-Control” but honour “Expires”. With “Expires” you get thus at least a bit control for these old clients. In any event, Page Speed won’t protest if you do end up sending both Expires and Cache-Control max-age, or if you remove both Last-Modified and ETag, but I was able to get the best results with just setting Cache-Control max-age and removing the ETag. On Apache, configuring the proper headers can be done in the .htaccess file, using the Header directive. The Header directive requires the mod_headers module to be enabled. Add the following code to your .htaccess file to set your Cache-Control and Expires headers, adjusting the date to be one year from today. Header set Expires "Sun, 17 July 2011 20:00:00 GMT"
Header set Cache-Control "max-age=216000, private, must-revalidate"
Most sources recommend simply removing ETags if they are not required. Entity tags (ETags) are a mechanism that web servers and browsers use to determine whether the component in the browser’s cache matches the one on the origin server. If you’re not taking advantage of the flexible validation model that ETags provide, it’s better to just remove the ETag altogether. Add the following code to your .htaccess file to remove ETag headers. If your host has the mod_expires module enabled, you can specify Expires headers by file type. Godaddy does not have this module enabled. What happens when you change files and need to force browsers to load the new files? Christian Johansen offers two methods in his post on Using a far future expires header.